When a Mediterranean princess disappears on the eve of her coronation, Lizzie Smith takes on the acting role of her life as her stand-in. But the Royal Palace is full of mystery and whispers of danger. Why does the sinister housekeeper insist Lizzie remains in her rooms? And what has become of the princess? As Lizzie learns her role, her only confidant is her quiet bodyguard. Lizzie begins to fall for Léon…but what secrets is he keeping from her? 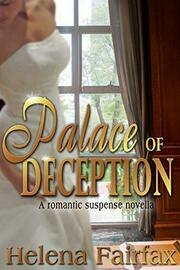 Mystery, suspense and romance in a beautiful Mediterranean setting. Fans of Mary Stewart will love Palace of Deception.